Erie Family Health Center representative Angela Sibert talks to residents Monday night about the expansion of the affordable health care services at the center's planned Hartrey Avenue and Dempster Street site. Experts talked Monday night about addressing mental illness among Evanston’s homeless as caretakers nationwide observe Mental Health Awareness Month. City residents and members of the homeless population chimed in on the stigmas attached to mental health illness and homelessness at a meeting organized by the nonprofit Interfaith Action at St. Mark’s Episcopal Church, 1509 Ridge Ave.
Two mental health experts from Connections for the Homeless, the nonprofit running Evanston’s homeless shelter at Hilda’s Place, 607 Lake St., discussed the importance of providing affordable health services to the homeless population. The organization works alongside Interfaith Action to provide health services to the homeless. “People really have to understand when we (are) intervening with people who are homeless … we hope they can leave with a primary health provider,” said Maria Moreno, a nurse at Connections for the Homeless. Claire Astone, a mental health specialist with the organization, suggested the daily stress homeless people experience prevents them from moving up the economic ladder. Many homeless people do not have a safe environment to take medication for illnesses or care for themselves, she said. Tests for preventing diseases such as Tuberculosis at Hilda’s Place have sharply reduced the number of active cases, Moreno said. However, many people do not use services provided by health centers for fear of being stigmatized, she said. “People are afraid because they get labeled,” Moreno said. Interfaith Action director Sue Murphy said she has seen the number of homeless people seeking basic services at the center every day more than double in her time working there. 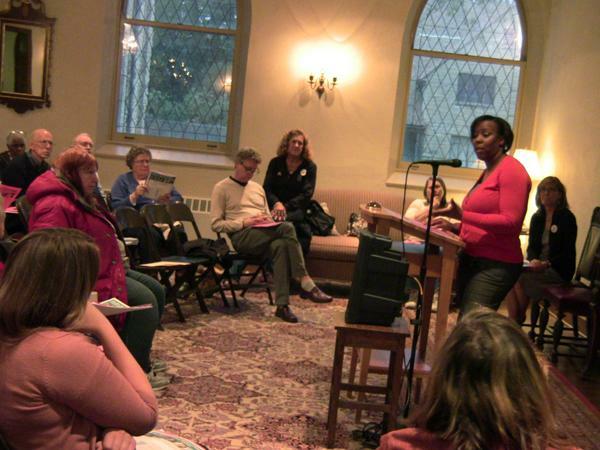 The topic of homelessness was chosen for the seasonal meeting by a committee following a winter meeting focused on working with people who got out of prison, said Carolyn Gifford, president of the Interfaith Action board. Brady Scholar Alex Domash said he attended the meeting because homelessness is one of the focuses of his philosophy program.